The Lodge That’s Not a Lodge! It may sound like a funny thing to say, but it really sums up the fact that our lodge is not like most others in the province. Our philosophy is to offer our guests a very flexible and personal experience. What we don’t do, gives our guests more of the things they want. They want time with their buddies or with their families kicking back and having some laughs. Planning which fishing spots they are going to hit today. Taking the boat out early, or maybe later in the day. Preparing the fish they caught that day together, to eat together. A private cabin where they can be themselves. Basically no schedule, no agenda and nothing but free time – isn’t that what everyone is looking for! The Sas staff will look after anything you need, you just have to ask. But otherwise we’ll leave you alone to enjoy your time, your way. For those who think they would love an outcamp experience, Sas Lodge often fits the bill. Total freedom and flexibility, but someone always there to lend a hand. This has been the norm at Sas for decades, and our guests love it! The camp at Sasa-Ginni-Gak is situated on the point of an island, in the middle of our beautiful lake. The various sized cabins are sprinkled along the shoreline. The main lodge building is where you will find our staff to answer a question or help you with anything you need. This is also where you will find our small shop humbly offering a choice of snacks, bug spray, fishing lures and minnows. The Main Lodge building at Sas is a gathering place for our guests to come together. The great room is a beautiful, large open room with two decks and lake views all around. 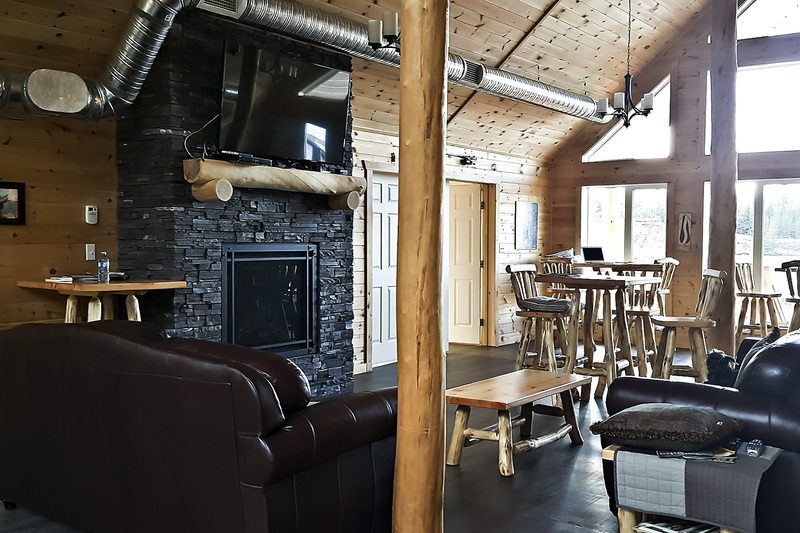 Whether you come in to grab a coffee and ask the staff for the latest fishing hot spots, or relax and enjoy the game, the lodge is always open and all are welcome. When you arrive at Sas Lodge, come up to the main lodge building to get filled in on what you need to know for your stay. If needed, you can hang out here until your cabin is clean and ready for you. Again, at the end of your stay, and the staff have loaded your gear to take to the dock, you can relax in the lodge until the aircraft arrives to pick you up. This is especially appreciated in rainy weather! Sasa-Ginni-Gak Main Lodge and Conference Centre on Sasaginnigak lake. Main lodge has Wi-Fi available. Gas Fireplace in main lodge. 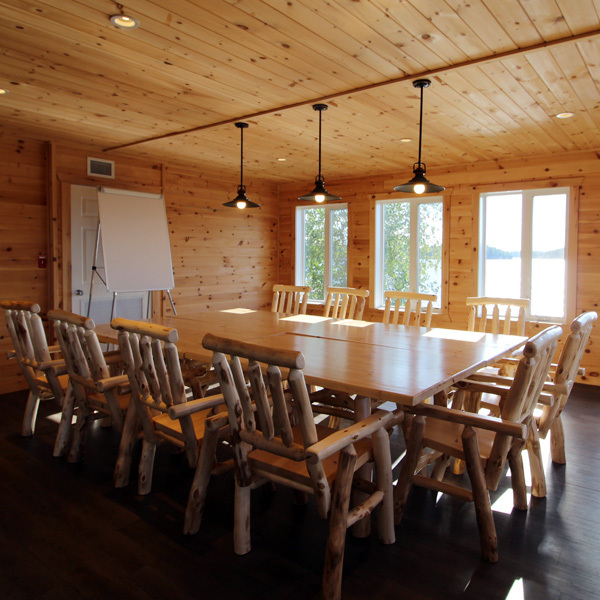 Large Conference/Meeting Room overlooking the lake. Main lodge has satellite TV. Main lodge has a Small convenience store where you can purchase fishing licenses, frozen minnows, and a small variety of fishing tackle and snacks. Fishing licenses are available at main lodge. Main lodge has a staff kitchen and office. If you are considering coordinating an event for team building, a corporate meeting, or a family get-together or celebration (a wilderness wedding maybe? ), consider Sasa-ginni-gak Lodge for your “destination meeting”. 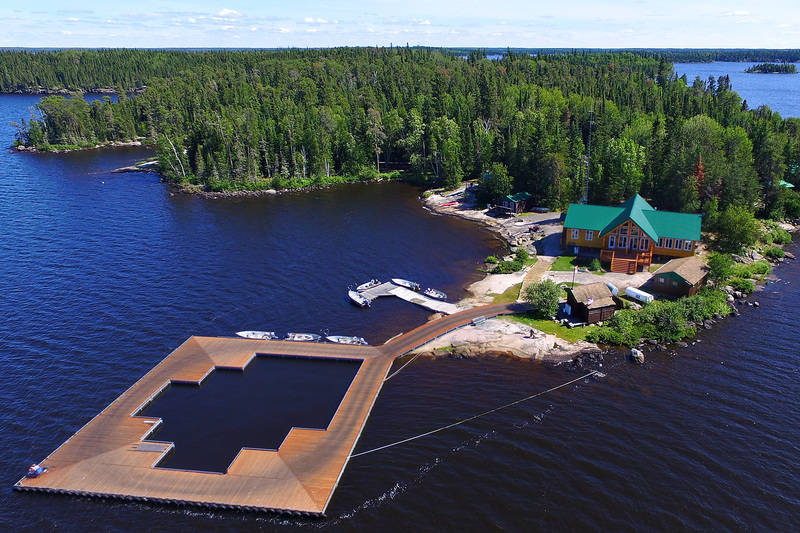 There is no better place to clear your mind and focus than our serene lake in the boreal forest. 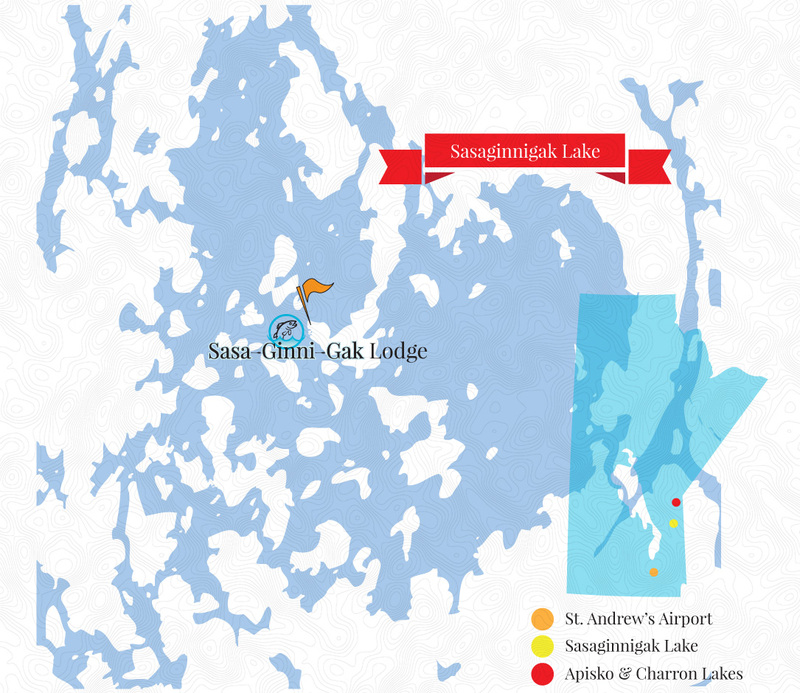 We will help you plan all the details of your trip so you can have peace of mind when you arrive at Sasaginnigak! 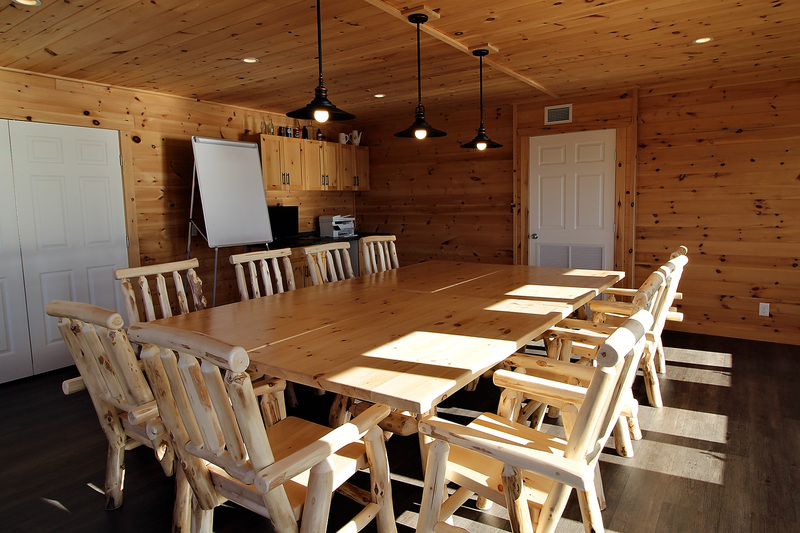 Our conference room comfortably seats 12 and attaches to our great room in the main lodge. The entire facility can be booked for larger groups. Our conference room is set up for meetings with four individual tables that can be separated or put together as one large group table. This room easily accommodates 12 at this large table. The room can accommodate up to 20 people. 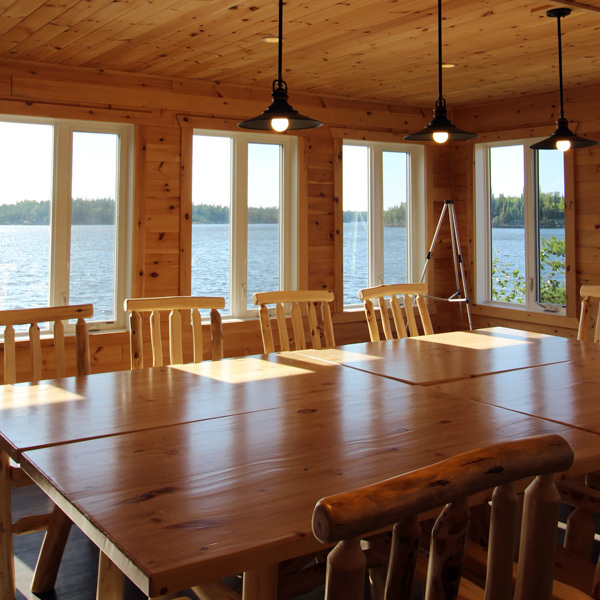 This room has an amazing view of the lake and provides a great relaxed setting with rustic log tables and chairs. If your group would like to celebrate a special occasion such as a birthday or anniversary, just let us know and we can even hide the cake if you want to make it a surprise! Room use is $30 per day. For bookings of 30 guests or more, you can book the entire camp privately for your group. Sas Lodge will provide a group rate based upon the total number of guests. Use of the conference room and great room will be available to your group at no charge. A group facilitator/leader/coach can be accommodated individually. Special requests for other guest services will be priced on an individual request basis. Our camp can currently accommodate up to 43 guests. Sas Lodge is open from the middle of May until the middle of September. The exact opening and closing dates can be found on the current year rate sheet. Charron and Apisko Outcamps will open about 10 days later than Sas, as the ice goes off these lakes later because of their location further north. IS IT SAFE TO DRINK THE WATER? WHERE DOES THE WATER COME FROM? SINCE YOU HAVE WI-FI, DO YOU HAVE A COMPUTER AVAILABLE FOR CUSTOMERS TO USE? No, we do not provide any computers for customer use as most people have their own laptops, iPads, or smart phones that they are welcome to bring with them if they choose. DO YOU SELL GROCERIES AT THE MAIN LODGE STORE OR DO WE HAVE TO BRING GROCERIES WITH US? 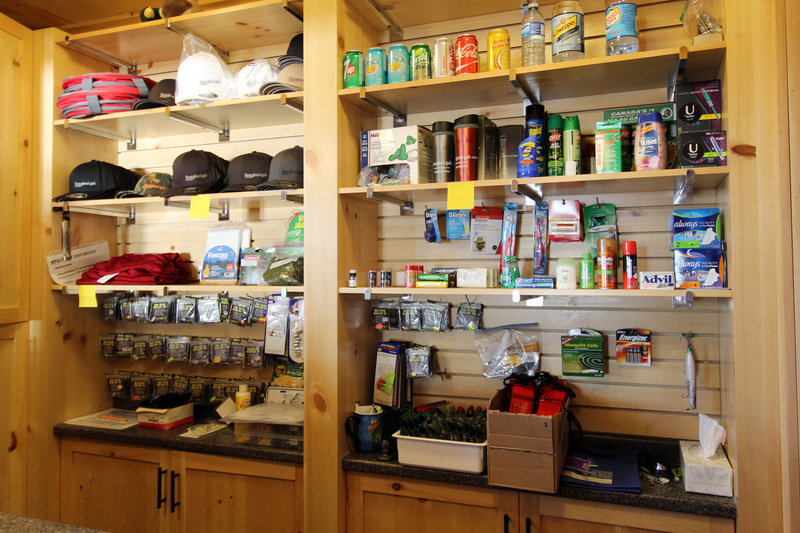 No, our “shop” at the lodge only sells fishing licenses, frozen minnows, and a small variety of fishing tackle, bagged ice, bottled water and a few items might forget, or need more of, such as bug spray. However, we do offer a grocery purchase service for a fee. If you send us a specific grocery list for food, beverages and or liquor we can pick it up before your trip and have it ready on your departure day. Alternatively if you are flying into Winnipeg and being picked up by our free passenger van shuttle, the van can take you to a nearby supermarket to purchase your groceries before you are brought to St. Andrews. Please inquire when you make your reservation. We accept Visa, Mastercard, American Express, debit or cash. There is a credit card machine at the lodge to take payments for incidentals purchased during your trip. Gratuities are never expected, but are certainly appreciated. If you wish to tip by all means do so, based on the level of service you have received. Tips can be given directly to pilots or individual staff at the lodge. The Canadian Federal Government has cancelled the GST Rebate program, effective January 1, 2018. There is no other rebate program in place at this time. All groups/guests are required to sign our Damage Waiver document (either one per person or one per group) before your trip. We do not charge a damage deposit fee ahead of time. However under such circumstances that equipment or furnishings have been damaged or ruined due to neglect or misuse, we will assess a service fee or replacement cost of the items and bill the head of your group. Please email us expressing what type of job you are looking for and attach your resume. Send this to jobs@northwayav.com. Or you can complete our “contact us” form and we will reply to you.